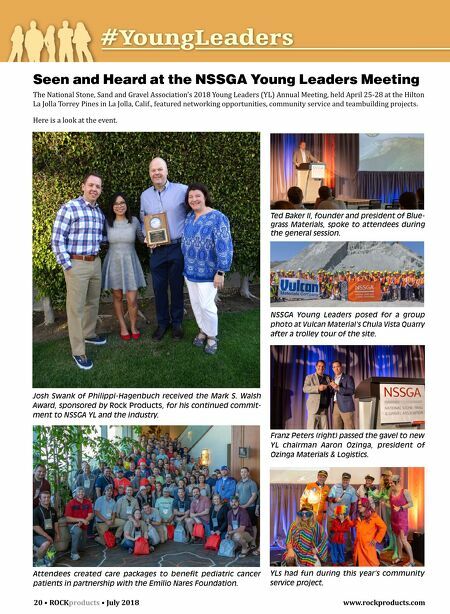 20 • ROCK products • July 2018 www.rockproducts.com Seen and Heard at the NSSGA Young Leaders Meeting The National Stone, Sand and Gravel Association's 2018 Young Leaders (YL) Annual Meeting, held April 25-28 at the Hilton La Jolla Torrey Pines in La Jolla, Calif., featured networking opportunities, community service and teambuilding projects. 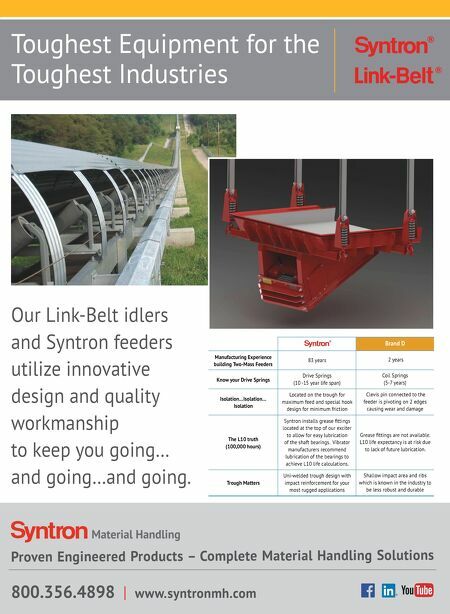 Here is a look at the event. YLs had fun during this year's community service project. Ted Baker II, founder and president of Blue- grass Materials, spoke to attendees during the general session. NSSGA Young Leaders posed for a group photo at Vulcan Material's Chula Vista Quarry after a trolley tour of the site. Franz Peters (right) passed the gavel to new YL chairman Aaron Ozinga, president of Ozinga Materials & Logistics. Josh Swank of Philippi-Hagenbuch received the Mark S. Walsh Award, sponsored by Rock Products, for his continued commit- ment to NSSGA YL and the industry. Attendees created care packages to benefit pediatric cancer patients in partnership with the Emilio Nares Foundation.